If sailing the finest sailing waters in the world interests you, then the perfect destination is the British Virgin Islands. Here you can sail yourselves or hire a boat with a crew. The best way to explore these islands is by boat, but several of islands do provide excellent accommodations, beautiful waters, and amazing beaches. The British Virgin Islands are made up from 50 or so mountainous islands, rocks, and cays between the Caribbean Sea and the Atlantic Ocean. The most popular islands to visit are Tortola and Virgin Gorda. For a romantic dinner, take your loved one to Drake's Anchorage on Mosquito Island. This is also a fabulous resort that offers simple lodgings on the beach. Have a cocktail while watching the sunset at Tortola's skyworld. Discover isolated beaches and bays by chartering a boat for a day or a week. Take an early morning swim in the Baths on the Island Virgin Gorda. Dive to explore the wreck of the RMS Rhone, which sunk off Salt Island in 1867. Stop and look at the Arawak Indian relics and colonial artifacts in the Folk Museum located in the capital city of Road Town. 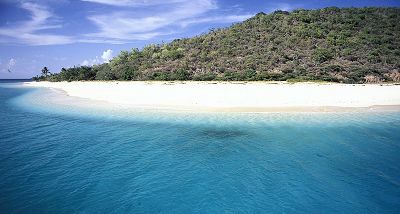 For $15,000 a day, enjoy a celebrities favorite BVI getaway and rent your own island! This price includes lodging and meals for up to 24 people. The best time to visit the British Virgin Islands, are all year-round. The average temperature is 85 degrees in the day time and 70 degrees at night. The British Virgin Islands, one of the most stable and prosperous in the Caribbean, is highly dependent on tourism, generating an estimated 45% of the national income. An estimated 350,000 tourists, mainly from the US, visited the islands in 1998. Tourism suffered in 2002 because of the lackluster US economy. In the mid-1980s, the government began offering offshore registration to companies wishing to incorporate in the islands, and incorporation fees now generate substantial revenues. Roughly 400,000 companies were on the offshore registry by yearend 2000. The adoption of a comprehensive insurance law in late 1994, which provides a blanket of confidentiality with regulated statutory gateways for investigation of criminal offenses, is expected to make the British Virgin Islands even more attractive to international business. Because of traditionally close links with the US Virgin Islands, the British Virgin Islands has used the dollar as its currency since 1959.